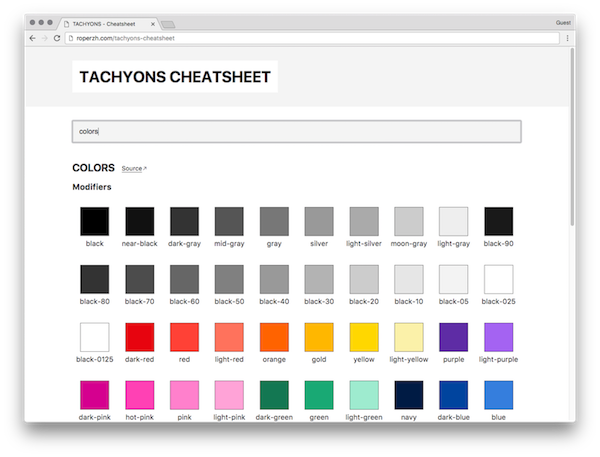 Want to be notified of new releases in roperzh/tachyons-cheatsheet? I had a lot of trouble while learning how to use Tachyons, there are a ton of new classes to learn and I have bad memory. So, I decided to create this interactive cheatsheet. This project does not intend to be source of the Tachyons truth or to replace the excellent documentation. Instead, use it as your friendly companion. All the documentation is stored in yml files under the docs folder, this files are parsed and converted to a single json file located in app/assets/data.json. All the code contained in this repository, unless explicitly stated, is licensed under an MIT license. A copy of the license can be found in the LICENSE file.